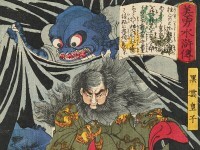 This print depicts the same scene as the print to the right [EAX.4855], where the twelfth-century warrior Taira no Kiyomori is haunted by the ghosts of the enemies he has ruthlessly killed during his lifetime. Here Kiyomori (depicted as the Osaka-based kabuki actor Nakamura Utaemon IV (1769-1852), who performed this role in the first month of 1845) stands on the veranda of his palace looking out over his snow-covered garden. In his vision the trees, hillocks and even the lanterns have been transformed into skulls and skeletons.